If you need quality catering in Kalamazoo, there’s no better place to trust with your needs than Kalamazoo Country Club. Our team has the experience and capabilities to make sure that your group receives the best food and service they’ve ever had. If you need to plan a business party, family reunion, or any other get-together, Kalamazoo Country Club is here as your go-to place for the best catering in Kalamazoo. When you have Kalamazoo Country Club on your team, you know your catering in Kalamazoo will be perfect and exceed expectations. With an experienced team of chefs and planners, we pay attention to exactly the type of food you are looking for in your catering and help you design the perfect menu based on your tastes. 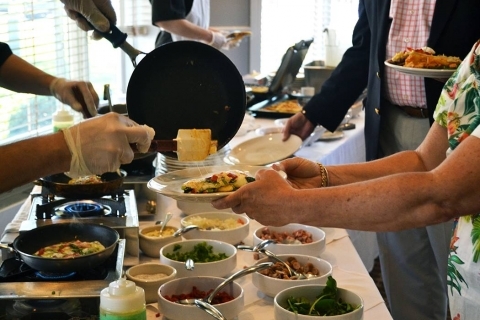 No matter the style of food you’re in the mood for, Kalamazoo Country Club can help satisfy everyone’s taste buds. Accommodation is our main priority, and we at the Kalamazoo Country Club make sure that we can help everyone who needs it by offering different sized rooms. Whether you have a small board group who needs one of our small rooms or a large family or business who can take a combination of our front dining rooms, there’s a space for you and others. With room for a dance floor or musician stage area in the larger spaces, you can make your get-together a full, impressive experience. With the ability to request the use of AV equipment in our rooms, you can even show pictures and video for your conferences, family reunions, and more. We want every visitor to Kalamazoo Country Club to have the best experience possible, and with the option of AV equipment, you have everything you need to entertain. With beautiful grounds, delicious foods, and accommodating staff, there’s no better place than Kalamazoo Country Club. If you are interested in quality catering in Kalamazoo and want more information on KCC, contact us today!